When we think of large corporations such as Apple or McDonald’s, it’s difficult to argue their influence on society globally has been anything other than transformative. Up there with one of the largest of these globally renowned brands is the Coca-Cola Company. Visit any country and you’re bound to see that big red logo on billboards, in supermarkets and shining brightly above fridges stocked with ice-cold bottles. The brand’s influence stretches so far it even helped define the colour of Father Christmas’s outfit. But with great power comes great responsibility and consumers are beginning to ask for much more than just a refreshing drink. Now they want businesses with a social conscience, a charitable mentality and an environmentally sound structure. And as the first rule of customer service dictates – the customer is always right. Over the course of the last year, the Coca-Cola Company in western Europe and its European bottlers joined forces to think up a new sustainability action plan, championed partly by Coca-Cola European Partners vice-president, sustainability Joe Franses. And so, in what became a defining year for environmental news, This Is Forward was born. “The plan was based on an engagement exercise where we went out to stakeholders and asked them to tell us what they want. It’s built on deep insight and included reaching out to employees, NGOs and consumers. We eventually focused on drinks, packaging and society as three primary issues,” says Franses. The plan relishes in its optimism and bold target-setting. Under its ‘Action on Packaging’ clause, it promises that by 2025, 100% of Coca-Cola’s packaging will be either recyclable or reusable and all bottles collected. It also aims to ensure 50% of the material used for PET bottles comes from recycled plastic and promises to become a pioneer in sustainable packaging. It’s one thing making the products recyclable, but how can manufacturers ensure that their products are recycled? And should they be held responsible for the actions of consumers? “The first thing is the responsibility of our business to make sure what we put onto the marketplace is recyclable. We’ve got to get that right, there’s no excuse for [not doing] that. “At the moment in some geographies we cover there’s a high collection, others are much lower and that’s not good enough. We want to be in a place that, by 2025, 100% of packaging is collected back, which is a big shift. 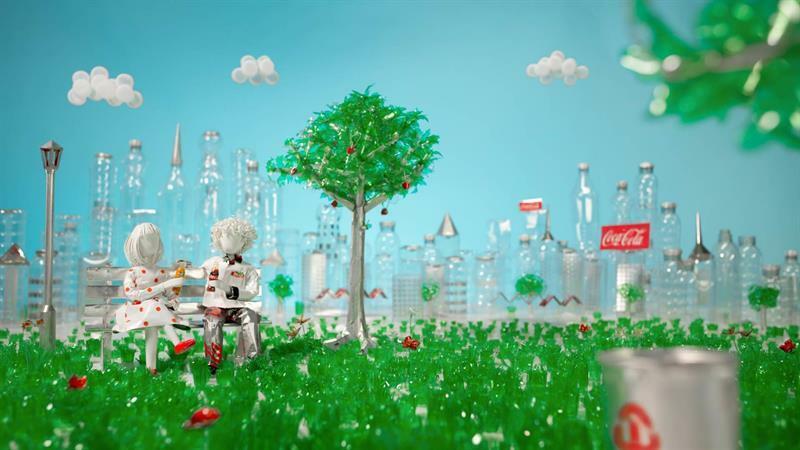 It seems Coca-Cola has really had a shake-up when it comes to its corporate responsibility. The brand is now using its reach to inspire others to recycle, having released a stop-motion bottle “love story advert” last year made entirely from recycled materials to demonstrate to consumers the importance of recycling. Yet the brand has not gone without its critics. For years, Greenpeace has championed the campaigns against plastic pollution, with Coca-Cola playing the role of the big bad wolf. It has run numerous “Don’t let Coke choke our oceans” demonstrations, including an alternative Christmas advert featuring Father Christmas dumping plastic bottles in the ocean and a spoof Christmas event in Piccadilly Circus. Is it fair that the company, one of many which uses single-use materials for its plastics, is given such a public shaming? When discussing the group’s campaigns, Franses demonstrates an admirable level of neutrality any politician would be proud of. He says: “We welcome Greenpeace’s challenge on plastics and we’ve got an ongoing dialogue with them. We don’t see it as frustrating but an opportunity as it widens the debate. As well as focusing on its plastic waste, Coca-Cola EP is also looking into eradicating bottles altogether in some catering environments. It is currently running a trial at Reading University where “free-style” machines have been installed for students to use with reusable plastic bottles, rather than purchasing a single-use bottle. The brand has also said it would welcome a “well-designed” deposit return scheme (DRS) in the UK. Franses says: “We have been working with DRS for many years and know that the schemes do deliver high collection and recovery rates. For Franses, sustainability has run throughout his career and is clearly something he cares passionately about. He says: “I’m constantly thinking about whether it’s right to throw something away or not. As we head into a new era of businesses operating with compassion, the onus is now on companies to play their part in caring for the planet and its natural resources – and 2018 is set to be a positive step forward for Coca-Cola EP.